Texas Twist was a birthday gift that I received last year as part of a trio of teas from Tea in Texas (the first was published in December of Prairie Green). 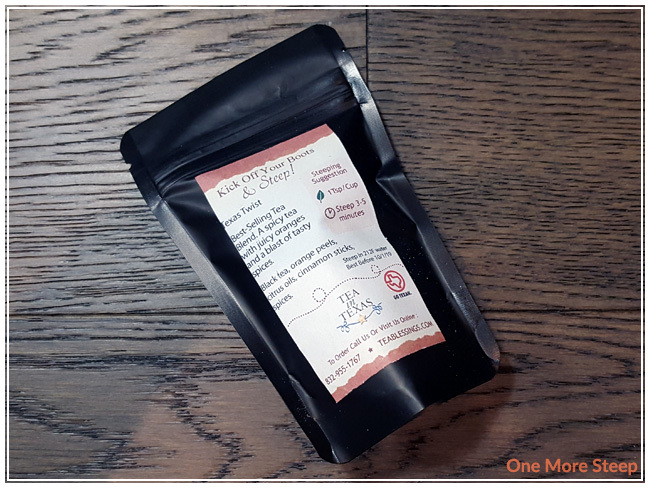 Like the previous review I did of a Tea in Texas tea, the loose leaf tea came to me in a resealable black bag that has the information about the tea printed on the label. The tea itself consists of: black tea, orange peels, citrus oils, cinnamon sticks, and spices. The aroma from the dry leaf is quite strongly of orange and cinnamon, the citrus aroma is bright (perhaps due to the addition of the citrus oils?) and is quite inviting. The label on this tea describes it as a best-selling tea blend for the company, so I’m quite eager to try it. Tea in Texas recommends steeping Texas Twist in 212°F (100°C) water for 3 to 5 minutes. I opted for my initial steep to be 3 minutes. 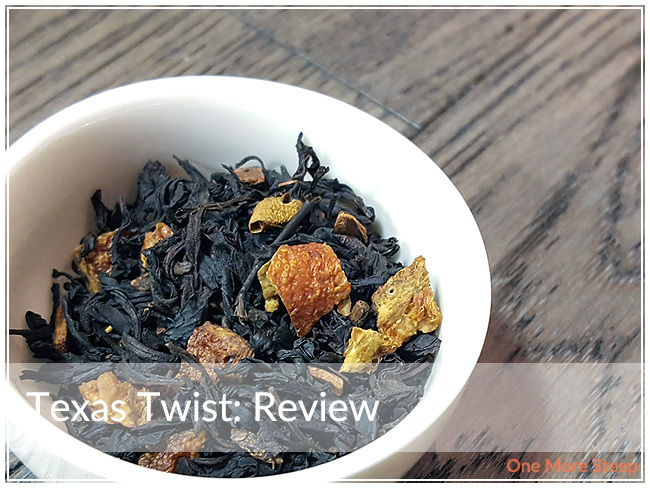 Texas Twist steeps to a deep orange, the aroma that wafts up from the tea as I pour from my teapot to teacup is primarily that of orange. The citrus aroma is strong in this black tea blend, which I can appreciate. There’s the underlying aromas of spices and cinnamon, I still can’t quite pick out which spices there are in this blend, but it smells good. When I sipped Texas Twist for the first thing, I was surprised at how sweet the tea is. Sugar isn’t listed on the ingredients list, so I’m chalking it up as part of just the combination of ingredients that are present in this black tea blend. I taste oranges, and cinnamon, and whatever spices are present in Texas Twist have an enjoyable warming quality to it. It reminds me a bit of the warming qualities that ginger has, but I don’t believe that I taste ginger in this tea. 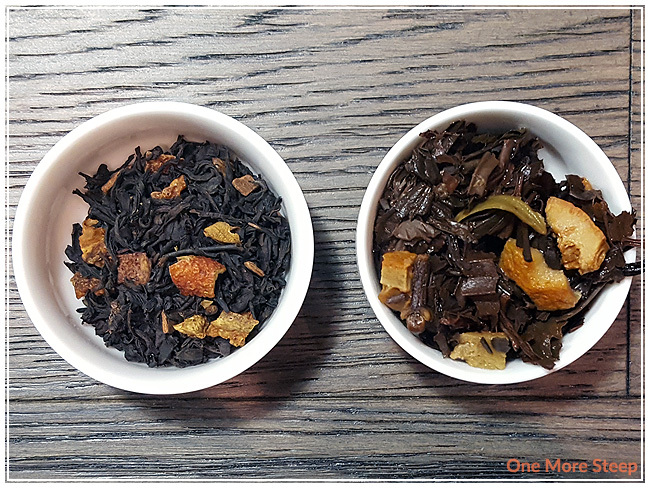 The black tea base lends a nice strength behind the tea, with a robustness and maltiness that reminds me of breakfast tea. I did allow a cup of Texas Twist to cool to room temperature to try it, but found that I enjoyed this tea hot better than cooled. Texas Twist is a black tea blend, so of course I had to try resteeping it. I wound up resteeping Texas Twist a total of three times (four steeps total with the same leaves). I increased the length of steeping time by 30 seconds for each additional resteep. 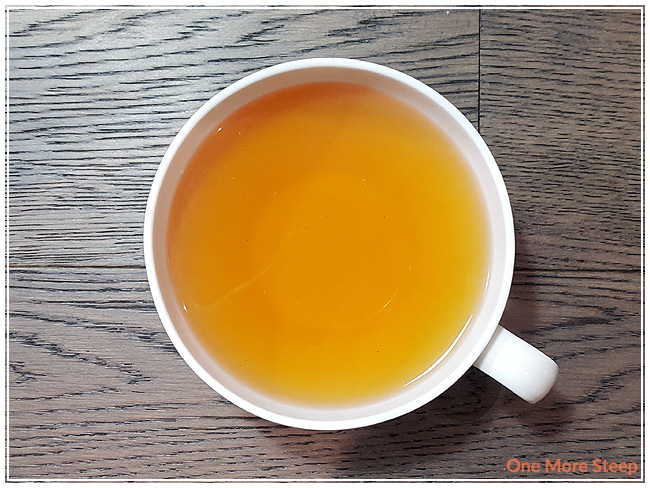 For the first resteep, I found that the tea tasted pretty much the same as the initial steep, with perhaps being a little lighter in orange flavour but the sweetness was still the same. The second resteep was a bit weaker, while the third resteep was the weakest (and the least tasty). I think that Texas Twist does well for two resteeps (three steeps total). I loved Tea in Texas’ Texas Twist. I always like when a tea blend can be resteeped, and Texas Twist fits into that category quite nicely. 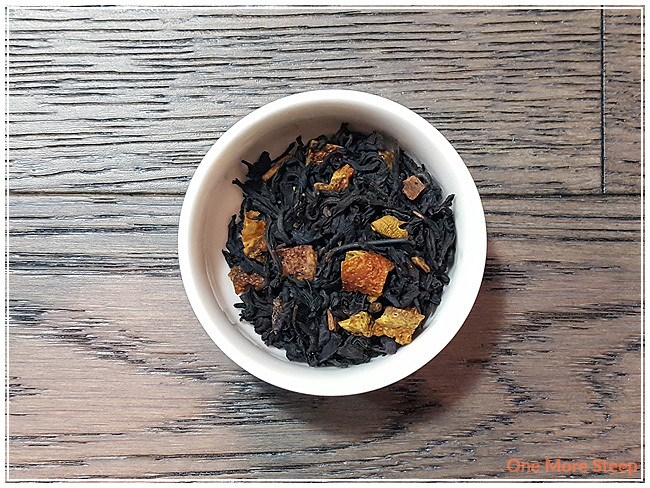 The natural sweetness that I found in this citrus black tea blend was enjoyable with a great warming quality to it. It has a nice strong black tea base to it that handles resteeping well. I wish that the product label (or the product page) had listed the spices – so if you have any allergies, I would recommend contacting Tea in Texas for more information.